Atlas Copco introduced the compact oil-injected rotary screw compressor from 7 to 37 kW: the 7-37 GA VSD+. Besides a small footprint, it offers a leap forward in Free Air Delivery (improvements of up to 12%), and energy-efficiency: it requires on average 50% less energy than a comparable idling compressor. This type of compressor offering a variable speed (frequency-controlled), will be suitable for most industries and aims to contribute significantly to the green economy needs. Atlas Copco evaluated every part in this compressor: a more efficient fan, robust air intake system, eliminating all blow-off losses, and the best electronic components together with the new drive train add up to energy savings of 50% on average compared to a traditional idling compressor of the same type. 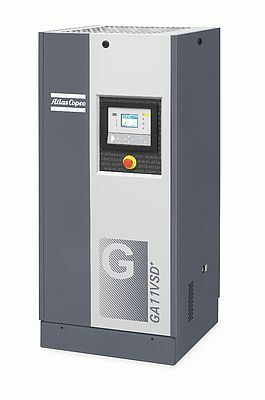 The GA VSD+ is another 15% more efficient than Atlas Copco’s current Variable Speed Drive compressor (the GA 7-37 VSD). A full feature version with an integrated dryer is available as option.